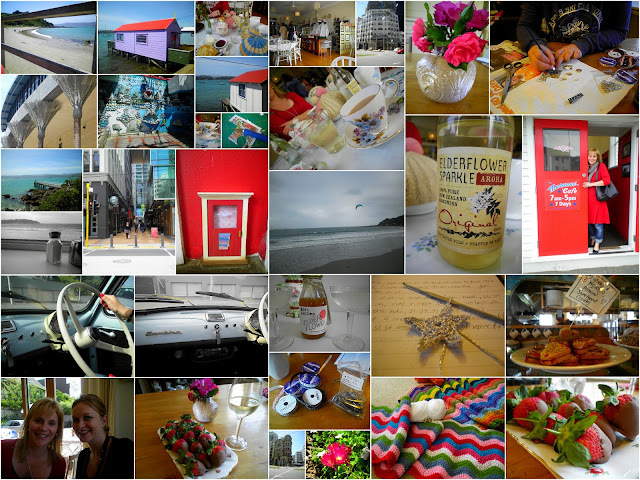 A weekend full of wonderful treats - I was so spoilt by my darling friend, Leah. Gosh I am so lucky. Lots of laughter, shopping, crochet, jewellery making, cafes (Martha's Pantry was a real highlight) and of course, lots of talking! I found some fabulous goodies on our op shop trips - including the perfect dress, and I was lucky to get a wonderful kitch tray for the caravan - made from a 70's puzzle - at a craft show (The Knack). I also had a real treat with driving Leah's classic car - I can't believe she let me. It is the cutest bright yellow Fiat Bambina, and I must have looked a right sight grinding the gears and giggling until tears streamed down my face! And we made some great new rings and necklaces. I've got some further supplies and have been busy making a few more goodies for Birthday and Christmas pressies. It's a busy time of year still, I'm not getting much time in front of the computer for fun, it's all work work work unfortunately. So I am here, but not posting much.